Yes, it’s of epic proportion. It’s of cosmic consequence. It’s unparalleled. It seems that nearly every company and every product is unparalleled these days. How is this possible? Does anyone believe it, or does using this adjective without including substantiation merely serve to build skepticism of all the words and claims that follow it. The multiple meaning of the word “medium” can serve you well. Use it creatively to refer to an industrial controls environment, or a business environment resulting from a trend….a software capability or communications mode… a culture for growing things, like ideas (literally or figuratively). Mix in a dash of prognostication, on occasion. Podcasts from Grammer Girl may actually prove that someone can make grammar tips popular. She’s getting national press. And it’s about time that someone helped us all get tuned into the rules. 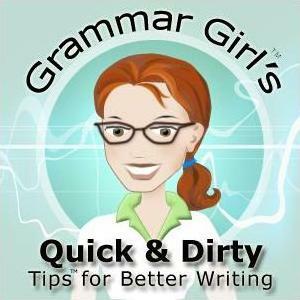 Check out her blog Quick and Dirty Tips for Better Writing. We want to help you subscribe to Word Currency. It takes about 3 minutes…less if you use Internet Explorer 7 or the latest Firefox browser. Call me (Dave Schmidt, 248.352.3333) and I’ll walk you through it. This entry was posted on April 3, 2007 at 3:51 pm and is filed under business writing, grammar, Marketing Communications, powerful vocabulary, Words that sell, Writing press releases. You can follow any responses to this entry through the RSS 2.0 feed. You can leave a response, or trackback from your own site.